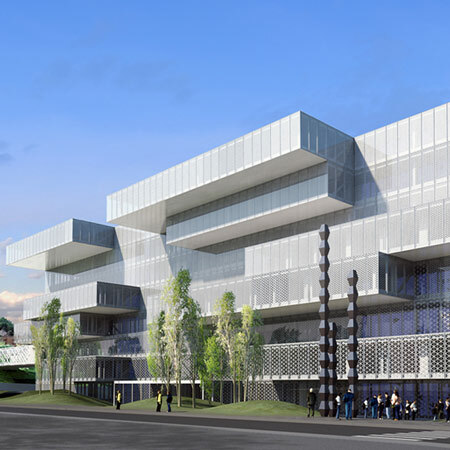 Architect Daniele Durante of studiobv36 in Italy has designed a new headquarters in Rome for the Italian postal service. Long volumes will be stacked in a staggered formation, forming cantilevered sections to shade large parts of the facade. Light will be reflected by white polycarbonate panels with triangular perforations, which will be sandwiched between layers of glass in the facade. There will be four different patterns with varying densities across the building's skin. Called IPost Building, the eight-storey project will house 600 employees. Construction is due to begin in January 2011. The main starting point of the project is its strong relation with the urbanisation of the area, and its adjacency to a highly density block including Telecom building. These relations have pushed the project idea towards a dialogue with the urban scale, making the building like a “perspective block”, with a strong plastic impact. The choice of the block is defined by the exact urban alignments, that opening onto and prolonging itself towards the city, we tried to transform the urban block from a closed object into a different vertical sequence of variable plane elements. The building is composed of 8 volumes in linear development, placed one on one. The main facade on Via Semeria is shaded by jutting volumes. The solar exposition is checked by a particular technological system. Each glass facade is made up of three glass layer, in the layer between the two glass panels, we find a white polycarbonate panel made from special triangular matrix. This allows the light to reflect, thus checking the glare and storing heat. There are 4 panels with a different permeability, that give the building textural homogeneity and volumetric density with nuanced effect, from the ground floor until the last level. Design collaborators: Federico Pitzalis, Fabrizio Arrigoni, Claudio Cortese, Stefano Jacopini, Martina Telò.